Bryson City, NC is located on the far southern boundary of Great Smoky Mountains National Park and hosts the Deep Creek and Lakeview regions of the park. Noland Creek Trail runs north/south off Lakeview Drive between Fontana Lake and the Noland Divide high above in the mountains. The trailhead is one mile north of the lake and heads in both directions. On this day Ken and I headed north up into the drainage. The Noland Creek valley contains a beautiful hardwood and pine forest and at one time was home to several settler families. If you look closely along the way perhaps you will notice stone remains from some of those settlements. 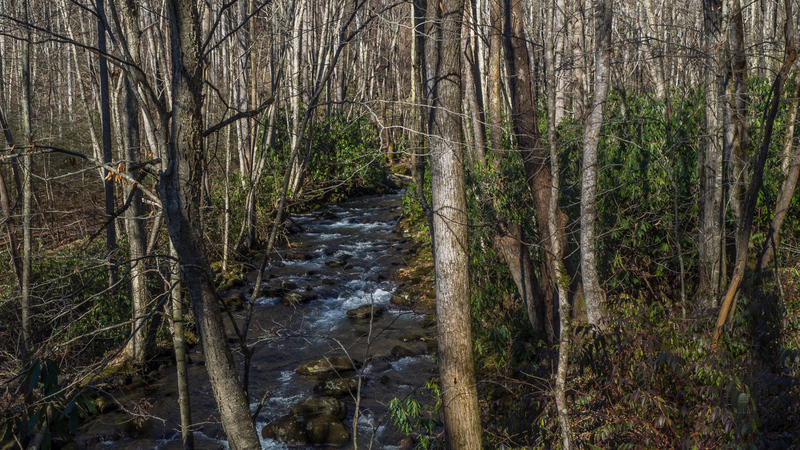 This is a delightful stroll through the Smokies woodland where the creek is your constant companion. We visited Noland Creek on Thursday, January 14, 2016 from 10:00AM to 3:00PM. Our plan was to take Noland Creek Trail as far as backcountry campsite 63, then return. Hike Rating: Moderate, mainly for length. Not strenuous. Trail Condition: Excellent. Trail is old roadbed that is very well maintained as far as backcountry campsite 64. Still in mostly good shape beyond that. Starting Point: Parking pullout on Lakeview Drive west of Bryson City. Trail Traffic: We encountered three horseback riders, half a dozen park service workers, but no other hikers. How to Get There: From the intersection of Hwy 441 and Route 19 in Cherokee, NC drive 10 miles south on Route 19 to Everett Street in Bryson City. Turn right onto Everett and continue for several miles. You will pass the Lakeview Drive entrance to the Smokies National Park. Look for a large parking area on the left just before a bridge over Noland Creek. The trailhead is at the west end of the parking area. If you reach the Road to Nowhere tunnel, you have gone too far. Before hitting the trail, Ken and I stopped for a few photos of Fontana Lake from Lakeview Drive, then drove the Road to Nowhere to its termination at the tunnel that passes through to Lake Shore. We then backtracked to the Noland Creek Trail. From the trailhead on Lakeview Drive, the trail heads down a few hundred yards to creek level. At the bottom you can choose to go left a mile to Fontana Lake, or turn right as we did to hike up the Noland Creek drainage. Back in September of 2014 I took the trail to the lake when I was in Bryson City to visit the Deep Creek area of the national park with my friend Dave. When we reached the end of Noland Creek where it feeds Fontana Lake we found both beauty and ugliness. There is a splendid cascade there, dropping 5-6 feet off a shelf of rock. However, looking toward the lake I was taken aback by all the backwash. The banks of the creek are littered with driftwood and logs, and yes, rubbish. It looks like a trash dump; quite appalling actually, especially for a national park. I’m told the boaters on Fontana Lake simply dump their trash overboard, and it ends up in these backwash channels. So sad. Not to worry today though, as we were heading north. We passed under the highway bridge, then over the footbridge for our first glimpse of Noland Creek. This is a wide one as creeks go, as big as some rivers I’ve seen in the region. What is wide too, is the trail. It’s really more of a road, probably used for logging at one time, and also to access the settlements that used to be in this valley. It’s well maintained too… very firm with almost no mud. It was cold in the hollow, at least 7-8 degrees less than up on Lakeview Drive, as evidenced by the icicles everywhere. Even the rhododendron leaves were drooping. Noland Creek is within earshot the entire length of this hike, and most of the time it is close enough to dip your toes as well. Backcountry campsite 65 is 1.3 miles from the trailhead. A spur trail crosses a little knoll then drops to the site with three picnic tables and Bearpen Branch nearby. We had noticed a horse trailer unloading while we were gearing up at the trailhead, and soon after we passed the campsite, they passed us. 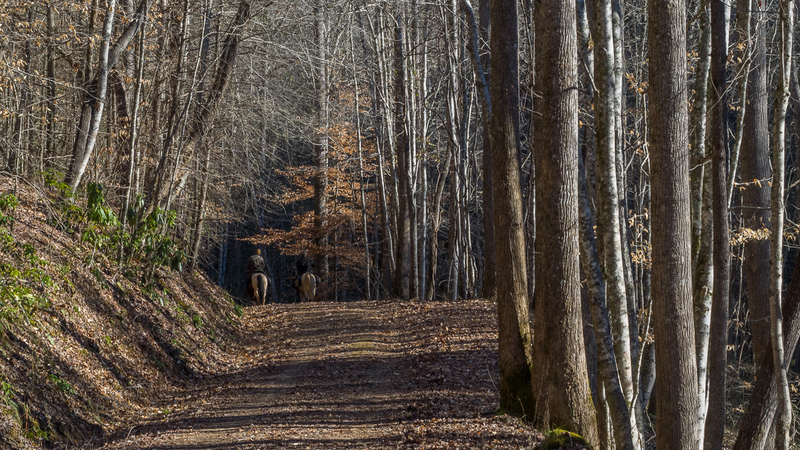 Noland Creek Trail is ideal for equestrian recreation. It is wide and firm, with plenty of room for side-by-side riding. The fellows in this shot stopped to chat with us for a few minutes and were very friendly. They were loving the beautiful day in the Smokies every bit as much as we were. Nearly two miles up the trail is a grove of beautiful, tall white pine followed almost immediately by another grove of cove hardwoods including beech, holly and eastern hemlock that are just as tall. Surprisingly, also tall is the rhododendron. These plants have been here for decades, towering twice as high as the guys perched on their horses. When the horsemen were out of sight, we heard faint sounds of a motor approaching from behind. Within a few minutes, sure enough, here came a pickup truck towing a wood chipper. The National Park Service was out for the day clearing storm debris from the roadside. We crossed another footbridge, then soon after reached the remnants of one of the old settlements. There are signs of the people who once inhabited this hidden valley. We found a chimney pile near a stone foundation. It’s all covered with bright green moss these days, but the stones represent 19th century living in the Smoky Mountains… fertile land, access to water, just a day from town. As we meandered on, there were two more bridges across Noland Creek, all suitable for foot, horse, and single-lane vehicle traffic. We were entering Salola Valley now. At one time it even had its own post office. Keep your eyes peeled for more artifacts including the remnants of a power station on the left. A water wheel rested on a foundation that captured the swift water flowing down Noland Creek and provided power to those who lived here in the early 20th century. We crossed one last bridge, then reached backcountry campsite 64, a trail junction of sorts. We were now 4.1 miles from the trailhead. The horsemen who had passed us earlier were here, as were the pickup truck we had seen, and another Park Service pickup with a different work crew. This place was jumpin’. We joined in the fun, finding a picnic table for ourselves to enjoy lunch. There is a connector trail here that goes to meet the Forney Ridge Trail and climb to Clingmans Dome. Also, Noland Creek Trail continues northward. After resting at the campsite, we decided to continue farther north to the next campsite about another mile and a half on. We found the workers from the other pickup. They were enhancing the footlog over Noland Creek just north of campsite 64, adding additional railings and tightening all the bolts and screws. I am always amazed at the Smokies footlogs. Usually made of tulip poplar they will last for decades and are part of what gives the national park its charm. After navigating the footlog at campsite 64, we were now on the east side of Noland Creek. The road isn’t in quite as good shape here as it would be difficult to get grading equipment across that footlog. The trail gets steeper over the next mile, but still not overly so. It is never strenuous hiking on this trail. In fact, I never found myself breathing hard. Despite being after noon, now the ground was still frozen, which was good for us as it would have probably been muddy otherwise. About half way to backcountry campsite 63 we crossed another footlog, the one pictured at the top of this post. As we got nearer the campsite we smelled smoke, not a good thing in a dense hardwood forest. Sure enough, when we arrived at the campsite there were logs still smoldering in the fire pit and no one to be seen. We each thought of what we had in our packs to haul water the 25 feet from Noland Creek to extinguish the fire. I had a small bottle and Ken had a half-gallon sized plastic bag. Perfect. Within 10 minutes there was no more smoke. Yay! While I took pictures of the creek, Ken went to explore the forest in the vicinity of campsite 63, also known as Jerry Flats. When he returned, he reported having seen three whitetail deer frolicking in the woods, totally unaware of his presence. I was disappointed to have missed it, but still relished his tale as we turned to walk back the way we had come. You can continue northward on Noland Creek for several more miles, eventually meeting the Noland Divide Trail that will take you all the way to Clingmans Dome Road. But we had had enough. It’s 5.5 long miles back to the trailhead from campsite 63. I’m not afraid to tell you my feet started getting pretty tired about half way back. The bridge workers were just about to finish up when we got back to there, and apparently the horsemen had turned around because we never saw them again. A mile down the road, the workers with the wood chipper had now sprung into action tossing branches and other debris into the jowls of the machine creating one helluva racket. But the trail looked clean. We encountered one other vehicle on our return trip down Noland Creek, a small road grader. The Park Service had really been out in full force on this sunny, delightful winter day. I’m happy to see that. I suppose there is new money for maintenance in the budget. To summarize, there really is no destination for Noland Creek Trail. It’s one of those hikes where you just walk along enjoying Nature, taking in the scenery, watching for wildlife, smelling the aromas, listening to the rushing of the mountain stream. It’s a four season hike, and one that would be easy for the entire family. Simply go as far as you want, then turn around. Access is convenient as it’s just a few short miles outside of Bryson City. Even the Road to Nowhere that you travel to get to the trailhead is quite scenic. This is also an excellent trail for those who enjoy horseback riding.